Ron Cembrowski reports on the 2016 Quinte International Air Show organized by the Royal Canadian Air Force's 8 Wing at CFB Trenton in Ontario. All photos by author. On June 25 and 26, 2016, 8 Wing / CFB Trenton held the Quinte International Air Show (QIAS). The show commemorated the BCATP and the establishment of the first 400 series squadrons of the RCAF overseas. The first of these squadrons were formed on March 1, 1941, under Article XV of the BCATP. This photo report covers some of the aircraft arrivals on Friday June 24 as well as both air show days on Saturday and Sunday June 25-26. A number of the aircraft scheduled for static display had already arrived by Thursday. The photographs of Friday aircraft arrivals were taken from off of base property, at the approaches to both Rwy 06 and Rwy 24. The air show opening ceremony began with the 8 Wing Commanding Officer Colonel Colin Keiver performing a tandem jump with one of the SkyHawks team members. Landing at show centre, Colonel Keiver then made his way to the main announcer's stand to give his welcome address. This was followed by an impressive display of canopy work by the SkyHawks parachute team. The daily flying displays included units based at Trenton as well as the CF-18 Demonstration Team and the Snowbirds. Civilian aerobatic acts and warbird displays, including a formation fly-by salute to WWII Veterans, were also part of a full schedule. The QIAS was one of only two shows in Canada to get the F-22 Raptor Demonstration Team, for 2016. The team is based at Langley Air Force Base, Virginia. Canadian Warplane Heritage - Lancaster Mk X and B-25J Mitchell in a formation fly-past salute to WWII Veterans with P-51D "Quick Silver"
F-22 Raptor Demonstration Team including a USAF Heritage Flight with P-51D Mustang "Double Trouble"
The base provided two full days of tremendous flying and static displays. The show was very well organized, with a large static aircraft display on the apron both east and west of Hangar 10, plus numerous displays within the hangar. The spectator crowd line paralleled a very large portion of main Runway 06 - 24, which provided plenty of viewing space for the public. At one time Trenton held an air show every two years. However between operational commitments and funding those days ended. The last time CFB Trenton had a full air show was in 2009 for the Canadian Centennial of Powered Flight (1909 - 2009). A much missed aviation event in Southern Ontario, it was a pleasure to see its return. If deemed successful by the 2016 QIAS organizers future shows at the base may be considered. In 2016, Airbus Defence and Space undertook a North American Tour of their C295W tactical airlifter in collaboration with the Mexican Air Force, having done a similar tour in 2015 in Latin America. The tour was designed to demonstrate the aircraft's reliability and versatility in a variety of weather conditions. The Airbus C295 is a candidate in the RCAF's Fixed Wing Search and Rescue (FWSAR) program. Other companies bidding on the project are the Leonardo (formerly Alenia Aermacchi) C-27J Spartan and the Embraer (Brazil) KC-390. The successful new aircraft will replace the RCAF's aging six CC-115 Buffalo and the older CC-130H Hercules, which are currently assigned to the SAR role. 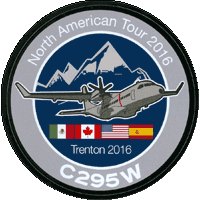 After its last stop in Winnipeg the C295W was placed on static display at the 8 Wing / Trenton 2016 QIAS on June 25 & 26. On completion of the Canadian tour the aircraft was to make stops in the U.S. prior to its return to Mexico. 419 Squadron (RCAF) was formed during WWII at Mindenhall, England, on December 15, 1941. The squadron was the RCAF's 17th squadron formed overseas and the RCAF's 3rd Bomber squadron formed under Article XV of the BCATP. The squadron (unit code letters 'VR') initially flew the Vickers Wellington MkIC and MkIII with No. 3 Group as a night bomber unit. The squadron converted to the Handley Page Halifax MkII in November 1942. On March 1, 1943 the squadron joined No.6 (RCAF) Group and in March 1944 began flying the Canadian built Avro Lancaster MkX. Today the squadron is known as 419 (Tactical Fighter) Training Squadron and is based at 4 Wing / CFB Cold Lake, Alberta. The unit operates the CT-155 Hawk in the fighter lead-in training role. To commemorate the squadron's 75th anniversary (1941 - 2016) a special paint scheme was applied to one of the unit's CT-155 Hawk aircraft. Designed by graphic artist Jim Belliveau the colour scheme is representative of the standard dark green and dark earth-brown topside colours and black underside worn by aircraft in RAF Bomber Command during WWII. The aircraft is dedicated to the squadron's first Commanding Officer, Wing Commander (W/C) John "Moose" Fulton, DSO, DFC, AFC (December 21, 1941 - July 28, 1942) of Kamloops, BC, and bears a combination of markings. The unit code VR-W, the dedication on the aircraft nose, and yellow "W" are in honour of W/C Fulton and the Wellington bomber he flew. The Moose emblem and the aircraft serial KB799 honour one of 419 Squadron's Lancaster MkX bombers which carried the oldest known "Moose" art of the unit. It should be noted that the Canadian Warplane Heritage (CWH) Museum's Lancaster MkX, "Mynarski Memorial Lancaster", is also painted in the Bomber Command colours of 419 Squadron (RCAF) aircraft serial KB726, code VR-A. 2 CFFTS, known as the "Big 2", is based at 15 Wing / CFB Moose Jaw, Saskatchewan and is the host unit of the NATO Flying Training in Canada (NFTC) program. CAE is the prime contractor for the NFTC program and is responsible for all support functions at the school including the provision of the Raytheon CT-156 Harvard II and BAE CT-155 Hawk aircraft. 2 CFFTS operates the CT-156 Harvard II in the primary and advanced (fast jet) training role. Graduates of the basic Harvard II course are streamed to either jet, multi-engine or helicopter advanced training. Those selected for jet receive further advanced training on the Harvard II prior to conversion to the Hawk as preparation for final their training phase at 4 Wing / CFB Cold Lake, Alberta. In commemoration of the BCATP, 2 CFFTS, with the support of CAE, had one of its CT-156 Harvard II's (156120) painted in a special colour scheme. The aircraft is overall yellow and is representative of the WWII "Yellow Wings" trainers used in the BCATP. The aircraft paint finish was applied by Plane Perfection in Prince Albert, Saskatchewan, and was completed on June 17, 2016. The Harvard II is displayed in the markings of a WWII North American Harvard flown by Pilot Officer (P/O) John Gillespie Magee Jr. during his training at No.2 Service Flying Training School (SFTS) at Uplands, Ontario, in June 1941. P/O Magee is best known as the author of the poem "High Flight". "High Flight" is now considered to be poem of the RCAF and is read at graduation and commemorative ceremonies. The CWH Museum's Lancaster MkX (serial FM213) was built by Victory Aircraft Company of Malton, Ontario in July 1945. It was converted later to a Mk X MR (Maritime Reconnaissance) and taken on strength with the RCAF on August 21, 1946. In 1952, with only 10.5 hours of flying time the aircraft was heavily damaged when the landing gear collapsed at Trenton, Ontario during a ferry flight. The Lancaster was nearly unsalvageable; however, a replacement wing centre section was located on a farm in Penhold, Alberta. That aircraft (serial KB895) was known as "Lady Orchid" and had flown with 434 "Bluenose" Squadron (unit code letters "WL"). Repairs were completed to Lancaster FM213 using the mid section from "Lady Orchid" and it was returned to active service flying with 405 Squadron (Greenwood, Nova Scotia) and 107 Rescue Unit (Torbay, Newfoundland). FM213 was retired in late 1963. In 1964 the remaining Lancaster's were retired from RCAF service. Lancaster FM213 was Struck off Strength on June 30, 1964, and was acquired by the Royal Canadian Legion in Goderich, Ontario, where it was placed on outdoor display. In 1977 the aircraft was obtained by the CWH Museum. After 11 years of work, on September 24, 1988, the Lancaster was restored to flying condition. There are currently only two flying Lancasters in the world: the CWH Museum’s Lancaster based in Mount Hope, Ontario; and the RAF Battle of Britain Memorial Flight’s Lancaster based at RAF Coningsby in Lincolnshire, UK. The CWH Lancaster is painted in the markings of 419 "Moose" Squadron, serial KB726, aircraft code letters VR-A, in memory of Victoria Cross recipient Pilot Officer (P/O) Andrew Mynarski of Winnipeg, Manitoba. The CWH Lancaster is known as the "Mynarski Memorial Lancaster". Over the last couple of years the CWH Museum has honoured other RCAF Lancasters and their crews by temporarily applying their markings to the Mynarski Memorial Lancaster. For the summer of 2016 the CWH Museum Lancaster will also have the markings and nose art of "Lady Orchid" (aircraft code letters "WL-O") applied to left side of the fuselage. It is an especially appropriate tribute given that "VR-A" was rebuilt using a portion of "Lady Orchid". Black decals were applied over the regular "VR-A" markings and for a more authentic look the "Lady Orchid" nose art was painted on. Post World War I, between 1920 and 1930, the majority of all Canadian military flying training was being carried out at Camp Borden, Ontario, the air base having been established by the Royal Air Force (RAF) during the First World War. The exception to this was the Flying boat and Seaplane flying training which at that time was being conducted at Jericho Beach (Vancouver), BC and Rockcliffe, Ontario. In the intervening years the Canadian Air Force, and subsequently its successor, the Royal Canadian Air Force (RCAF) began the search for a suitable site to establish a new training base. Twenty-five possible locations were considered in Ontario and Quebec. On October 11, 1929, in Ottawa, a site was formally announced as the new base location. The location was an area of farmland east of the Town of Trenton, Ontario along the shore of the Bay of Quinte. Initially an area of 870 acres was selected; this was later increased to 948 acres. Funding for the base construction was requested on May 10, 1929 by the Defence Department. With the onset of the Great Depression the economic benefits of the new base were quickly felt in the region. Additional funding was provided in the form of an Unemployment Relief Project (URP). The URPs were allocated by the Federal Government and were designed to provide assistance to the unemployed during the Depression years. On October 31, 1932 Unemployment Relief Project #28 was approved with work beginning by November 9, 1932 under that project fund. Operational units began occupying the base facilities even as construction continued. In September 1931 two flights of aircraft from No.2 (Army Cooperation) Squadron and No. 3 (Bomber) Squadron stationed at Camp Borden arrived at Trenton. This occasion marks the beginning of operational activities at the base. At the beginning of World War II an agreement between Canada, the United Kingdom, Australia, and New Zealand was signed (on December 17, 1939) making Canada the centre of air crew training for the Commonwealth. The agreement called the British Commonwealth Air Training Plan (BCATP), often simply referred to as "The Plan", has been recognized as one of Canada's greatest contributions to the war effort . RCAF Station Trenton was a central facility within the Plan. One of the first schools established at Trenton was No. 1 Air Navigation School on February 2, 1940. The school's focus was to train instructors for the first three BCATP Air Observers Schools (AOS): No. 1 AOS (Malton, Ontario), No. 2 AOS (Edmonton, Alberta), and No. 3 AOS (Regina, Saskatchewan). Trenton was also the central facility responsible for the training of flight instructors. These flight instructors in turn would train thousands of pilots as part of the BCATP in Canada. Initially formed at Camp Borden the Flying Instructor School (FIS) was transferred to Trenton in January 1940. In June 1940 the name was changed to No.1 Central Flying School (CFS). At the end of July 1942 the school had trained 2,622 flight instructors. As the BCATP expanded three additional Flying Instructor Schools were established: 1 FIS (Trenton, Ontario), 2 FIS (Pearce, Alberta) and 3 FIS (Arnprior, Ontario) which allowed the CFS, in Trenton, to concentrate on post-graduate courses for senior instructors. This resulted in much improved supervision to the BCATP pilot training and testing curriculum. This increased rigour helped give the RCAF a well earned reputation for its thorough training methods. RCAF Station Trenton was the largest facility within the BCATP. At its peak the station had 3,200 air force personnel and 500 civilians. In January 1945, as the BCATP was drawing to a close, the four training commands (No.1 Training Command (Toronto, Ontario), No.2 Training Command (Winnipeg, Manitoba), No.3 Training Command (Montreal, Quebec), and No.4 Training Command (Regina, Saskatchewan)) were amalgamated and replaced by No.1 Air Training Command at Trenton. The BCATP ended on March 31, 1945. On February 1, 1968, Canada's Air Force, Navy and Army were merged to form the Canadian Armed Forces (Canadian Forces). Under this unification RCAF Station Trenton became Canadian Forces Base (CFB) Trenton. On the 69th anniversary of the Air Force, effective April 1, 1993, wing formations were reintroduced into Air Command. CFB Trenton was designated as 8 Wing. Today 8 Wing / CFB Trenton is the largest base in the RCAF. It is the hub of air mobility for the Air Force and operates fixed wing aircraft in both the tactical and strategic roles. It is also the home of the Canadian Forces SkyHawks Parachute Team. A special thanks is owed to Sara Hart and the 2016 Quinte International Air Show Public Affairs Team for their kind support. report on the 2014 CFB Trenton Open House event.